Ketubah (ketuvah) Written in Aramaic, the Jewish marriage contract specifies the bride and groom’s commitment to each other. The ketubah is usually signed in a Jewish wedding ceremony before the wedding service. In a Jewish wedding ceremony, the wedding ring of gold represents the unending love and eternal joy a marriage will bring. It is customary to place the ring on the index finger during the exchange. One ancient belief is that the index finger is directly connected by a special artery to the heart and so the couple’s hearts are joined. During the final benediction in a Jewish wedding ceremony, the couple is wrapped in two tallitot (prayer shawls) around their shoulders. This wrapping symbolizes the private Jewish life the bride and groom will have together. The chuppah is a canopy, usually a decorated piece of cloth, that symbolizes the home the bride and groom will build together. The chuppah, in a Jewish wedding ceremony, is open on all sides, also symbolizing that friends and family are always welcome in the newlywed’s home. The seven blessings is a series of blessings that is chanted by the Cantor or Rabbi. In Judaism, seven is seen as the mystical number of creation and completion. These blessings thank God for the beauty of the moment and the splendor of life in a Jewish wedding ceremony. Rabbi Brooks, is the Rabbi of Congregation Kol Am in Freehold, offering a New Jersey ceremony in which the bride and groom are to be the center of attention, recognizing that they are the reason for the celebration! The more the couple shares their hopes and dreams, the more personal the ceremony can be. I can utilize traditional Jewish symbols within the ceremony, which are universal in their significance, so that people of all faiths can feel involved. 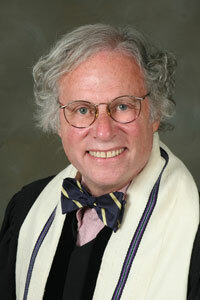 Rabbi Bill has dedicated his ministry to serving Jewish/Interfaith couples. God is everyone's God and your personalized New Jersey wedding ceremony can respect and include traditions of other faiths. Rabbi Bill will co officiate with all other clergy. Wedding Celebrant Diane is an experienced, heart-centered New Jersey Wedding Officiant who will perform an INTERFAITH wedding for a Jewish bride or Jewish groom that is marrying a partner of another religion. Diane will celebrate the sacredness of your marriage in a fun, relaxed fashion. She passionately guides you through the unique planning of your wedding ceremony, and presents you with a free Keepsake Copy of your New Jersey Wedding Ceremony which includes a lovely Certificate to officially commemorate your New Jersey wedding event. Diane works with you every step of the way so you can take those first steps down the aisle with confidence! Find out why we are the number one choice of Jewish couples in New Jersey! Call 732-262-3037 today or contact us on the form below. Be sure to include your wedding date and location. Any glass may be used for the Jewish wedding glass, although most couples choose a special glass to be broken and kept. It is commonly wrapped in a cloth napkin (to avoid dangerous glass shards) or enclosed in a pre-made cloth pouch. A “do it yourself” option is to purchase a single colored glass goblet to be used in the breaking glass Jewish wedding tradition. Look for a unique glass at a vintage or used thrift store. If you are planning on keeping the glass shards from the breaking glass consider colored glass instead of clear, especially if you plan to do a craft project with them later. Make certain the glass you choose is not too thick. It needs to be easily broken when stepped on! For this reason, stay away from heavy lead crystal goblets. The Jewish wedding glass pouch can be a simple rectangle of fabric that you sew around the glass, much like a pillowcase. Close the third end with ribbon or sew it shut. Choose fabric that matches your jewish wedding colors. Thicker fabrics such as velvet work well, but thinner fabrics can be doubled up. You don’t want them too thin or the glass shards will easily rip through it. In Jewish wedding traditions, a Jewish bride presents her groom with a tallit to wear for his Aufruf, the reading of the Torah prior to their Jewish wedding ceremony. The groom's family often gives candlesticks to the jewish bride that can be used during the actual Jewish wedding ceremony. It is also a Jewish wedding custom for Jewish men to cover their heads at all times, especially during prayers, with a kippot (yarmulkes), as a form of reverence, respect, and acknowledgement that God is present everywhere. In some congregations, jewish women also cover their heads to pray. Some Orthodox, Conservative, and Reform Jewish wedding ceremonies take place under a chuppah, a wedding canopy. The Jewish chuppah is a rectangular piece of cloth large enough for the bride, groom, Rabbi, and sometimes other members of the wedding party to stand under. The chuppah signifies the new home about to be shared by the newlyweds. Before the procession to the chuppah, the tanaim are signed, and the jewish groom is asked if he is ready to take on the jewish wedding responsibilities outlined in the kepubah. He signifies his willingness by accepting a handkerchief or other object offered to him by the Rabbi. The two witnesses to this sign the ketubah. While the actual text of the ketubah is never meant to vary, the border decorations on this document have over the centuries been the subject of remarkable artistic creations. At the beginning of the Jewish wedding ceremony, the bride might observe the Biblical custom of "Circling the Groom" seven times. This practice is seen as a powerful act of definition, where the bride will symbolically create the space that they will share as husband and wife. In Judaism, the number seven is mystical and represents completion and fulfillment. Just as the creation of the world was finished in seven days, the seven circles complete the couple's search for each other. The bedeken, or veiling, is a small ceremony in which the Groom lowers the veil over the Bride's face and by this act acknowledges that he is marrying the correct woman. This custom originated in the story of Jacob who didn't see the face of his bride prior to his wedding and was tricked into marrying Leah instead of his intended, Rachel. The Jewish wedding ceremony consists of two parts: Erusin (pre-engagement) and Nissuin (marriage). These ceremonies were historically performed up to one year apart, but more recently the two have been combined into one ceremony. The Eursin ceremony begins with Kiddush, the blessing over the wine. Kiddush is part of virtually all Jewish observances as a prayer of sanctification. The exchange of rings completes the Erusin ceremony. In Jewish law, a verbal declaration of marriage is not legally binding unless an act of Kinyan, a formal physical acquisition is completed. This is reached when two witnesses see the bride accept a ring from the groom, and he recites the words of marriage. After the ketubah has been read at the Jewish wedding ceremony, wine is often poured into a new glass, and the Sheva Berakhot (Seven Benedictions) are recited over it. The bride and groom then drink from the glass of wine. With the Jewish wedding ceremony complete, tradition calls for the groom to break the wrapped glass by stomping on it. This final action symbolizes the destruction of the Holy Temple in Israel, and reminds guests that love is fragile. The audience may shout Mazel Tov and the bride and groom kiss. Immediately after the Jewish wedding ceremony, the couple may spend a few private moments together, or Yichud as a symbolic consummation of their marriage. Later, the Mitzvah, or obligation, of rejoicing at a wedding reception is incumbent on the bride, groom, and wedding guests. Good luck with your planning your New Jersey Jewish wedding . . . Mazel Tov! New Jersey Jewish Wedding Officiants: Ask us for places in New Jersey to hold a Jewish wedding ceremony. We offer New jersey Wedding Services, Wedding Music, Wedding Photography & Wedding Video, Photobooths, Tuxedos, Wedding Cakes, Wedding Invitations, Wedding Flowers, Limousines, Ice Sculpture, Chocolate Fountains, and so much more! FREE wedding planner, wedding vows & articles! If you are planning the Ultimate New Jersey Wedding Ceremony of your dreams, you have come to the right place!